The White Elephant2 Bibliotheke3 is a multidisciplinary research project that investigates the construction of a library in a particular time and space. It is a model for a network that brings together many different types of information gathered through present encounters. This library could be described as a conceptual institution that is dealing with the concrete actions of producing or reproducing certain constellations of edited data (text/book) and to imagine ways to share them in a particular context. Its interests are to relate different kind of texts between themselves, always grounded to a particular social space. The criteria for what kind of information contains this Bibliotheke are been built at every certain moment regarding to what the individuals who activate it decide. The sum of all these criteria conform the institutional criteria. Last year 2014 a device programmed by Bibliotecha4 embodied the White Elephant Bibliotheke. 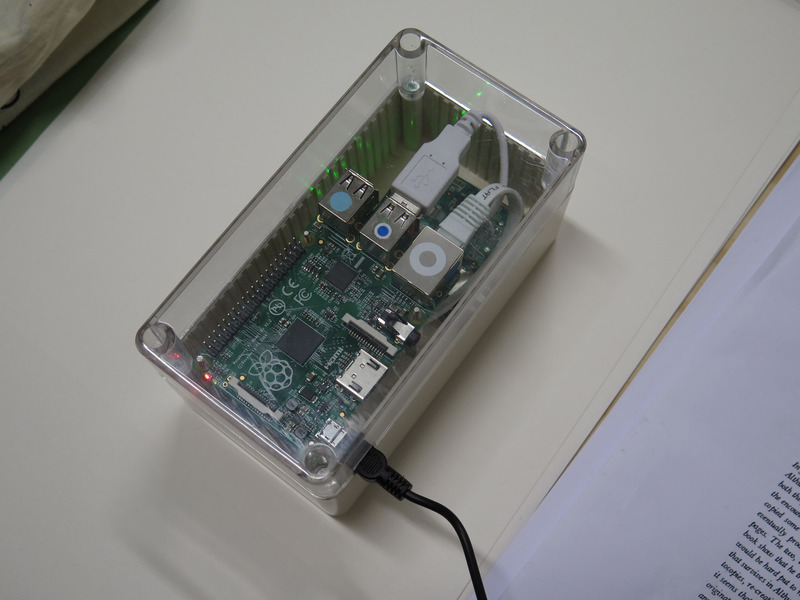 This allowed the library to share information through a microcomputer running open-source software that works over a local wifi hotspot. The shape the data can take inside this machine are pdf, epub, djvu and txt files. The disconnection from the Internet opens the opportunity to the library to be present in a different time rather than the web. From the programming view is important to have your own server at home. At the same time, for this project these ideas are suitable for the concrete context the library is aiming for. The library with this shape, stayed for one year in an art institution in the Netherlands (Jan Van Eyck academie) at Maastricht, as a way of establishing a communication between different participants who stayed there for one year. Also it was functioning for one week in an apartment in Madrid. The same week, the project was presented in a seminar called No Room for Books, which was trying to comprehend what is happening with our relation with books in this post-digital time. All the collection of information until now has comes from those experiences. At this moment the library is running in an apartment in Amsterdam, waiting for a better environment, which could host the library and relate it to a particular space.